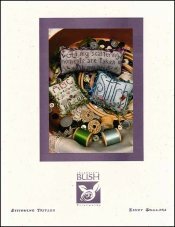 Stitching Trifles [D6207] - $8.00 : Yarn Tree, Your wholesale source for cross stitch supplies. A cross stitch pattern by Shepherd's Bush Printworks. Shepherd's Bush Printworks has provided us with three great designs for any stitcher! The first design features the saying, "All my scattering moments are taken up with my needle." A few flowers are stitched around the saying. The second design says, "Stitch." The third design has "ABC" stitched at the top then a row of thread, a pair of scissors & a heart. Two sheep stand below the scissors, thread & heart. There's no better time than stitching time! Stitch counts: "All My" is 29 x 80, "Stitch" is 35 x 46 & ABC is 29 x 33. "ABC" is stitched on #2349 Zweigart Belfast Linen 32ct. Limestone.